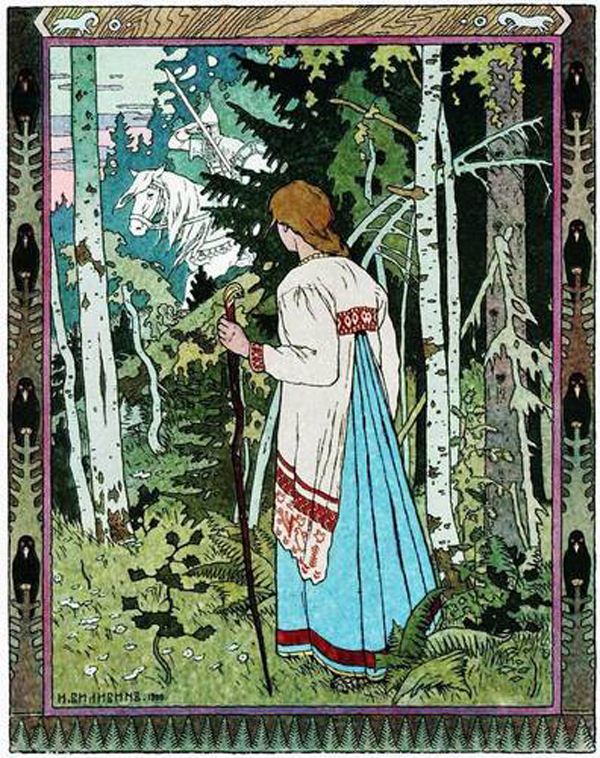 Ivan Bilibin (i876-1922), a favorite fairy tale illustrator, not to mention a beloved costume and set designer. Like any retired librarian worth her weight in overdue notices, Simplia never left the library without an overflowing book bag. You know, one of those canvas ones from Scholastic or Follett or Baker and Taylor? Sagacia too, though her modest bag collection from National Public Radio could not compare to her friend’s. Simplia lifted the trunk and the Simpletons hoisted their bags inside. The satisfied pair of readers slipped into their seats and Simplia started the engine. As her friend steered onto Mulberry Street, Sagacia began flipping through the book back to front for a peek at the marvelous artwork. One image—the one where Vasilisa in her embroidered sarafan sees the white horseman—was covered by a sheet from a yellow legal pad, which she pulled out of the way, and, flipping it over, saw . . .
. . . the letter. Of course. It was the magical third day of the month, after all! Or close. It had probably arrived last night, after hours, when the library was closed. “Of course!” she chuckled, then read aloud. I am so excited that this year’s Summer Reading Club theme is “Every Hero Has a Story.” What a treat for us lovers of Fairy Tales; an open invitation to tell our most favorite stories! As I began to list out mine, I started thinking about the qualities of heroes and heroines that makes me love and admire them, the qualities that they inspire me to work harder to develop within myself. I started wondering what others thought about that, too. I mean, it’s not the dragon-slaying that makes a hero, it’s the heart to take on the dragon in the first place. It’s not defying the king/father that makes a princess a heroine, it’s the belief in something beyond her present life or the faith in her prince and the power of their love. It occurred to me that some of your readers (or “magical friends,” as the Simpletons call them—and I won’t deny that they are magical!) have thoughts about what makes a hero a hero, and I wonder if they’d be willing to share them? I know it would help me and maybe others make make our summer story sessions magical and meaningful. Oh, and who are their favorite heroes? I’d like to know that, too. Thanks, Dearest Heroine! Oh, and don’t say anything to Baba Yaga about the hands! At just that moment, Simplia noticed they were approaching the intersection with Lobby Lane. She flipped her turn signal. Oh and! Vasilisa the Brave is my absolutely favorite folk tale of all time. And. I’m a children’s librarian. 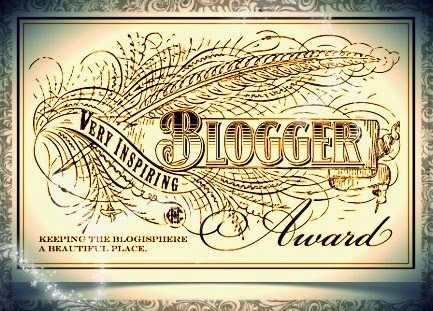 You have a lovely blog here. I’m glad I found it. I’ve learned more about heroes while researching tales, familiar and unfamiliar, to post on my A-Z Blog Challenge. I believe likely and unlikely heroes hold one or more of these virtues: perseverance in the face of adversity, personal courage, resourcefulness when needed, optimism, confidence in themselves and others, empathy, and the knowledge that failure is an important step towards succeeding. Some of my favorite heroes and heroines are: Col. Gail Halvorsen (Berlin Candy Bomber), dog heroes such as the sled dogs, Balto and Togo, Fa Mulan, the Rainbow Crow, Abbie Burgess who kept the light house lights buring during some horrendous storms, Jack in many of his tales, Issun-Bishi, smallest samurai ever, and of course, Vasalisa the Brave. I thoroughly enjoy reading the Fairy Tale newsletter. It makes me think and wonder about Fairy Tales. I hope “The Simpletons” have the energy to keep going. The “Simpletons” are very clever and well informed. Thanks for doing this. Thanks so much, Norris! Your words mean a lot to us–and thanks for sticking with us!